A few minutes more would spell the doom of every man who held that pass. Already they were falling fast, though they locked their ranks closer and held like iron. Those wild men of the North were dying in their tracks; and looming among their golden heads the black lion-mane of Kull shone like a symbol of slaughter, and his reddened mace showered a ghastly rain as it splashed brains and blood like water. 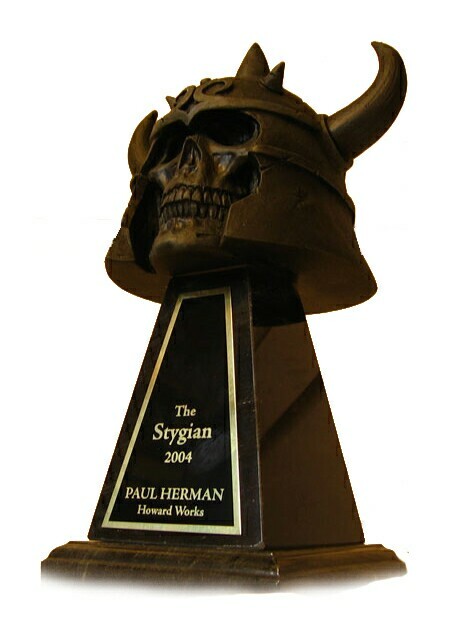 Bill Thom, who administers the useful Coming Attractions pulp web site as well as Paul Herman’s Howard Works site, has alerted me that he has put a page on Howard Works advertising the fact that it has won the Stygian Award for Best REH Website of 2004. That’s the idea. The question is: will any other websites out there rise to the challenge and try to dethrone Howard Works next year? Almost alone among the current crop of Howard websites, Howard Works is undergoing major renovations. It will take some hard work and ingenuity to surpass it.